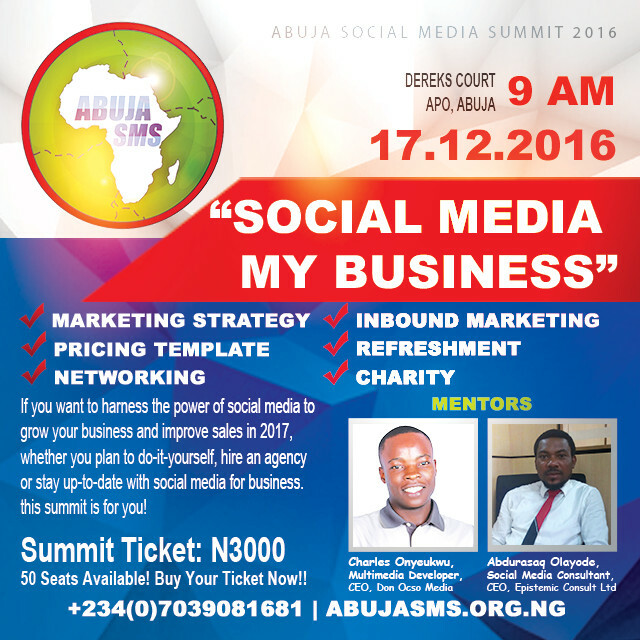 Abuja Social Media Summit cordially invites you to her 2nd annual summit on social media marketing and social media for social good. Venue: Dereks Court, 24 Moses Adasu Close, Zone D First Gate, Apo Legislative Quarters, Abuja. About Abuja Social Media Summit? Our summit is designed to educate, empower and build capability using social media as a tool. The Summit is a two-way charity event, we offer great value for less price and donate half of the summit proceed to charity, to send children in the rural areas of Abuja to school for free. If you want to harness the power of social media to grow your business and improve sales in 2017, whether you plan to do-it-yourself, hire an agency or stay up-to-date with social media for business. this summit is for you! Who Should Attend Abuja Social Media Summit? Business Strategists, Entrepreneurs, Employees, Social Media Hobbyists, and people looking for a new career. Business Strategists are extremely intelligent, but ask them to establish a workable strategic plan for social media marketing and they’ll freeze up! This leaves them with no other choice but to hire a social media manager. Any professional business strategists know social media managers can be expensive. If you’re a business strategist, learning to create a social media marketing strategy can change your business entirely. Giving you an edge over the rest. Entrepreneurs have big dreams, and in many cases, shoestring budgets. To survive in the cut-throat world of startups, it’s a necessity to have a world-class social media presence. However, world-class social media presence comes with a huge price tag. If you can learn how to build a high-quality social media presence by yourself. Then you’ve just saved yourself a lot of cash, hundreds of thousands of naira in most cases. Any company knows the education and training of their employees is key to a thriving team. Depending on the type of company you work for, if you understand how to harness the power of social media to improve sales, that gives you negotiating power for a better position, or a higher salary. Do you spend most of your time on BBM, Facebook, Twitter, Instagram, Google+ or YouTube? Then the training is for you! Come learn how to start making money with social media – the possibilities are truly endless. If you are out of work or looking for a more rewarding job that can allow you to work from almost anywhere in the world. Becoming a social media consultant might be the answer for you. Social media consultants in Nigeria are paid well, anywhere from N240,000 to more than N500,000 per year (from one client). They get to work with amazing companies that are changing our world, and still enjoy the ability of starting their own companies, become location-independent and work from home, or wherever they want! Call 07039081681 to buy your ticket now! Visit http://abujasms.org.ng for more information. Save the date! 17th December, 2016.